None of us like getting Library fines; but at the same time nobody likes missing out on the resources they need to for their next assignment. Our fines exist to ensure that everyone has fair access to the books they need, and that items are renewed regularly or returned promptly either if no longer required or if they’ve been requested by another user. Managing your borrowing responsibly is one of the ingredients of a successful degree. With self-service machines, email reminders and online renewals we try to make it as easy as possible for you to keep track of your borrowing and the good news is that with a little care you can get the most out of Library resources while avoiding fines altogether. The best way to do this is to understand our loan periods and renewals system, so here’s a handy guide to help you do just that. When you issue an item you should always get a receipt which will tell you the date and (if it’s an Express Collection s item) also the time it is due back. You can also check your record online to see when items are due. To do this either click the ‘patron record’ button on the Library Catalogue or log-in to MyExeter and just click the ‘Library’ tab. Select ‘Your Library Record’ > ‘Items currently checked out’. This will show a list of what you have and when they are due. You can choose to sort by due date, to see which items need to be returned or renewed soonest. You can renew items as many times as you need so long as they haven’t been requested by another user. If a book gets recalled the loan period will shorten automatically giving you one week to return it (unless there is already less than a week left until it is due, in which case you simply won’t be able to renew at the end of that period). We will send you an email if your book gets recalled informing you of its new due date so it’s important you check your University email regularly. 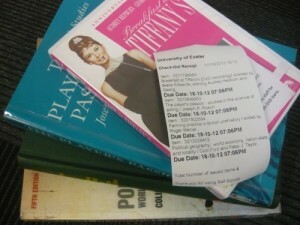 We also send out email reminders when your Normal and Short Loan books are due for renewal and again if they go overdue. Please note that due to the short nature of the loan period we can’t currently send advance reminders for Express Collections items. Lots of borrowers find it handy to set an alarm on their phone or computer to remind them to renew these items. Your receipt, your online Library record and the email reminders we send should help ensure that you know when you’re reaching the end of your loan period. If you still need the items you can always renew them so long as nobody else has requested them. The best way to renew is online, via your Library Record. Log in to your Library Record, either through the Library Catalogue or via the Library tab on MyExeter. You’ll see a list of the items you have on loan, together with the date they’re due for return. If you only want to renew some of them, tick the boxes by the items you want to renew and click Renew Selected. If the renewal was successful, the Status column will clearly state ‘renewed’ and show the new due date. If any items cannot be renewed, a message will appear to warn you of this and the status column will show the reason why. Need more guidance? Why not watch our video demonstration of online renewal? You have normal or short loan items that are more than 7 days overdue, or Express Collections items that are more than 7 hours overdue. Remember our 7 day/7 hour rule. These items are now very overdue and we need to hear from you to make sure you still have the books and to address any problems before further renewal will be possible. If you have items that have hit this level of being overdue please contact us as soon as possible! Further renewal may will still be possible but we need to hear from you at this point so don’t delay. You have outstanding fines of over £10. It is best practice to pay off any fines – however small – as soon as they accrue but if you have fines of over £10 your library record will be blocked until the debt is reduced. If need to renew but have fines of over £10 please pay off the fine first (see below for how to do this). Once the fine is paid you will then be able to log in and renew online as described above. Your item has been recalled by another user. All Library resources are subject to recall and can be reserved by other users. If your item has been requested renewal will not be possible and you will need to return it by the date shown on your library record (which may be different from the original issue date shown on your receipt) . In these situations the item will clearly show as ‘not renewed’ when you go through the renewal process. Please contact Library staff if you have any questions or would like additional advice about any recalled items. or in person at any of the Library desks. If you have any trouble with the online system please contact us as soon as possible. The above tips should help you keep on top of Library borrowing and avoid items going overdue, but if you do get a fine, these are the things you need to know. If you do have an overdue item, the first thing to do is stop fines going up any further by returning it, renewing online (for items less than 7 days overdue, or 7 hours overdue in the case of Express Collections items) or contacting us to request a renewal (if your items have already exceeded the 7 day/ 7 hour rule). At the point it is returned or renewed the fine will add to your account. 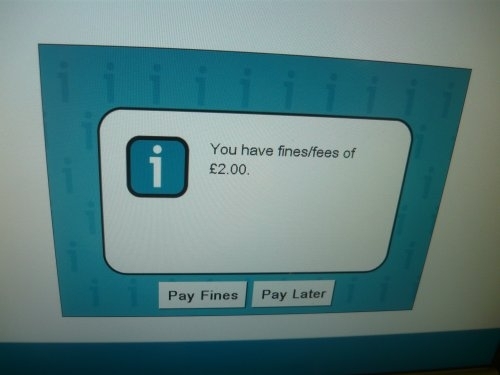 You can check your fines via your Library record, or on any of the self-issue machines on the Library. Library fines should always be paid off as soon as possible and remember that fines of over £10 will prevent you from borrowing or renewing further items. Fortunately, it’s quick and easy to pay your fines online with a credit or debit card: simply visit the fines payment site and follow the onscreen instructions. Always click on the “Finish” button at the top or bottom of the payment summary once you are done (don’t just close the browser!) Please note minimum online payment of £1. By cash, cheque, credit or debit card at the Forum Library or St Luke’s Library during their desk opening hours. By cash or cheque only at Research Commons during their desk opening hours. As always, Library staff are here to help so if have any questions or concerns about loan periods, fines or anything else for that matter do get in touch! This entry was posted in Using the Library on 27th Oct, 2013 by reg206.